My grandmother’s garden is legendary in our family for many reasons, not the least of which is that it was weed-free. After planting, she would spread layers of old newspaper between the rows, to make a nice weed-suppressing barrier that still let moisture through. On top of the newspapers would be a luxuriously thick layer of straw mulch. The resulting garden not only didn’t have weeds, it was mud-free as well. In fact, walking in her garden was like walking on carpet! And at the end of the season, she’d plow all that organic goodness into the soil to spend the winter composting and turning into next year’s giant tomatoes. It was a weed-control, pleasure-enhancing, and soil-enriching project, all in one. Happy tomato plants already reaching out of the straw mulch. Here in the age of mulch yards and landscape companies, it’s funny to think that in her day, mulching was a new – and strange – idea. Following the advice of Ruth Stout’s No-Work Garden Book, my grandmother’s thickly mulched garden was out of place among the bare, plowed (weedy, muddy) garden rows of her generation. This year I’ve planted my biggest garden yet, and I’ve done several things – like the German Johnson tomatoes – in honor of my grandmother. And this weekend, after seeing how quickly the weeds sprouted in my new garden, I decided to give her weed-proofing method a try. Paper: I really couldn’t tell the difference between plain brown paper and the “landscape barrier” paper I bought, so I think any unbleached, uncolored paper (preferable recycled) would work just fine. Straw mulch on top of paper. Cardboard: Cardboard is a great weed barrier, but I would put it only in the aisles, not right up against your plants where it might deflect water or smother roots. Newspaper: Talk about home recycling! If you use newspapers as a weed barrier, you might want to make sure the inks are safe for your soil. You can also check with your local newspaper office – they will often give you leftover rolls of clean newsprint for free. Landscape fabric: Landscape fabric is great for letting water through, so you can put it closer to your plant stems without worrying about deflecting water. Landscape fabric isn’t biodegradable, though, so you’ll need to remove it before plowing your garden. Once the paper was in place, I put down bales upon bales of wheat straw. I wanted that garden so well mulched that it would stay clean, cool, moist, and weed-free even on the hottest of summer days! 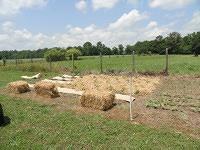 You can use whatever mulch you like – pine straw, wheat straw, hardwood mulch, you name it – just lay it on thick. I chose wheat straw because it was economical and would break down quickly over the winter. Finally, since the day had proven challenging with paper-catching breezes, I watered the garden thoroughly to settle down the straw and paper. Now, with everything thickly mulched and the aisles blocked with biodegradable paper, I DARE weeds to sprout! The best part about this weed-proofing method is that it’s completely organic, and this year’s mulch will turn into next year’s compost. That’s about as easy as it gets! And after a few years of mulching and natural composting, I can only imagine how big my tomatoes will be. Nothing out of the ordinary, Janette! Results will vary based on the application and your location. I used this method in my 20’x30′ garden and it worked well at first, but straw bales inevitably contain some seed heads and I ended up battling the wheat all summer. It grew like grass between the rows. The straw was indeed lovely to walk on, but not worth the headache. I won’t use it again. My vegetable garden is 10′ X 4′ surrounded by concrete building blocks. I’ve removed most of the hard dirt and have a 5″ depth to work with. My question is would putting the weed block barrier as the bottom layer and filling in with garden soil to a depth of 4-5 inches work for most vegetables like lettuce, spinach, squash, mustard/collard greens, green onions? I also fill the holes of the concrete blocks with soil and grow parsley and big, tall basil in them. Don’t aspire to farming but do like to grow my own veggies. I guess your grandmother’s garden was weed free, but if she used that many newspapers and let them rot into the soil for the next year, that garden sure wasn’t toxic free. All those toxic inks bleached back out into the soil and then probably into the food she cooked, canned, and froze from the garden. But she was very resourceful and like all older folks didn’t let anything go to waste. American would be a lot better off today if we all recycled and made use of things instead of sending them to a trash dump or landfill. Pine needles are NOT a good mulch, unless you are mulching blueberries or other acid-loving plants. Would pine needles work as a mulch. Will they break down? The garden is very well. The paper does a great job in keeping weeds down. I have to buy some more paper as I had to rip up the papers when trying to put stakes around the roses. This is the very first time I have seen paper used to stop weeds. How did the garden work out, and do you still use this method? I look forward to the day when weeding is not necessary. I’ve used wheat straw the past few years. I don’t get run of the mill weeds growing, but I do get wheat grass growing from the straw I used. Then I have to go over it and pull up all the new green wheat grass. It comes up rather easily, but still defeats the purpose of putting down a weed barrier. And then there is the cleanup. I usually have to dispose of some of the straw at the end of the season because it’s just too much to till into the garden. One last thing. 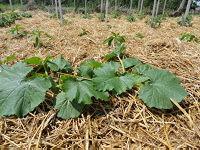 Is wheat straw a good mulch for shrubs and tea roses over winter? I stuffed mine full of straw last fall and didn’t think I got as good a result as I would have expected. Anything better for winter mulch? I have many small beds in my vegetable garden. I’ve been using paper & cardboard covered in horse bedding–the stuff that looks a little like fine wood chips for the paths. Been using cocoa hulls for the beds but hadn’t thought of putting paper down first–great idea. My biggest problem is creating a weed barrier around the perimeter of the garden. I’ve been using 30″ wide black plastic. Today I pulled some back & a maze of roots. No wonder weeds keep popping up in the beds. Is newspaper ink safe for vegetables? I spent 3 hours this morning putting down newspaper and then straw on top. I don’t like weeding garden, so I’m happy I found this method! I learned that landscape fabric that is referred to as a ‘weed block’ does not work very well alone. It took weeks to smother the weed growth underneath. I am now using a thick layer of newsprint with landscape fabric over it. I think that this will help in the weed suppresion. Have used this for several years; however, I use straw not hay. No problem with it germinating (I use cardboard in aisles. )Lay it down on calm day and water so it will stay down. No weeds and no sand on lettuce and Swiss chard so washing is much easier. Turn it under with leaves in fall. Makes great compost for spring planting. Since I live in New England, I use black plastic on tomatoes, cakes, and zucchini to warm soil. I have a huge roll of cotton batting, can i use this as a weed barrier? ie: place cotton on top of the clay (I live in Georgia) then place the soil on top of the cotton, then plant my starter seeds in the prepared soil. Will this effective in allowing the water to drain and repel weeds? I’ve got a ridiculous question I’m sure….at what point do you put the straw down? If I put the straw down as I plant, and simply brush it away from where I planted the seed, I’m afraid the wind will blow the straw over the seed and then not allow it to grow. Should I wait until the plants peak out of the ground? Or, am I over thinking this? I love the idea of using straw and newspaper as mulch. Have used it a couple of times and it works great…sometimes. The last 2 times I have had so much wheat grass growing that was as problematic as the weeds. Any ideas on how to stop the leftover wheat kernels from germinating. I thought about buying them a year in advance and let them sprout in the bale, then cover them so they dry out and can’t grow. I would have to think ahead and that probably won’t happen. Any suggestions? I love this idea. Just wondering how you water? Since I’m not seeing corrugates, I assume you sprinkle your garden? Just trying to figure out the best way to set up my garden this year! Thanks!